This post marks five straight months of this blog ending the month with a Yahoo title. That means five months where something in the chess world caught the attention of the mainstream press. While last month's post, January Yahoos, had only a feel-good story, this month's post has both a feel-good and a feel-not-so-good story. When John Urschel retired from the NFL last year after just 3 seasons with the Baltimore Ravens, it made headlines. In recent years, several young players, including Chris Borland of the 49ers, have bowed out of the sport early due to growing concerns over the potential for long-term brain damage, but Urschel’s motivation was different: he just didn’t have time for football anymore. Now, Urschel has quietly set himself a new goal: he wants to become a chess master. John Cameron Urschel is a Canadian mathematician and retired professional American football guard and center. He played college football at Penn State and was drafted by the Baltimore Ravens in the fifth round of the 2014 NFL Draft. Urschel played his entire NFL career with Baltimore before announcing his retirement on July 27, 2017, at 26 years old. The second story appeared twice in the Yahoo news feed. This is not unusual, except that the look changed the second time. I wasn't sure which instance to use, so I captured both of them. The first link led to the following article. The world governing body of chess has had its financial dealings frozen amid allegations its scandal-hit president facilitated the funding of Islamic State terrorists. FIDE, the Lausanne-based federation which runs the game, disclosed on Tuesday that Swiss bank UBS closed its accounts after finally losing patience with its failure to depose Russian millionaire Kirsan Ilyumzhinov. Ilyumzhinov, who was once part of Vladimir Putin’s inner circle, was placed on a US wanted list in November 2015 for allegedly being involved in oil deals which left a financial trail to the terror group ISIS via the Syrian government. In a letter published on the FIDE website, treasurer Dr. Adrian Siegel revealed UBS had shut its bank accounts and the federation faces a "serious problem" paying bills just weeks before the Candidates, its flagship world championship playoff tournament in Berlin. I've been following the sanctions saga since the end of 2016. 2016-12-15: Spectating the 87th FIDE Congress; '[Ilyumzhinov] then briefed the delegates on the situation regarding the US sanctions. '; post links to the Treasury.gov document 'Treasury Sanctions Networks Providing Support to the Government of Syria' (November 2015). Posts marked '(*)' are from my World Chess Championship blog. An election for FIDE President will take place later this year. Next up in the video series covering the eight players who will be competing in next month's Candidates Tournament - Berlin is Vladimir Kramnik, who gained entry to the event as the organizer's wildcard choice. For the previous video in the series, see Interview Videos : Karjakin. The interview followed Kramnik's win in the second round of the 2017 World Cup - Tbilisi (Georgia) last September. For another interview with Kramnik on the same day, see 'I am not one of the favourites but four years ago too I wasn't very young' (Youtube channel: ChessBase India; 'Published on Sep 7, 2017'), where he is referring to his victory in the 2013 World Cup - Tromso (Norway). Source: Chess Cast. If any owners has an issue with any of the uploads please get in contact and it will be deleted immediately. Thank you for your cooperation. I found the original video at World Cup 2017 Tbilisi on Livestream (livestream.com/chesscast). I also found three other copies of the 'Chess Fan' / 'Chess Cast' video on other Youtube channels. Who owns the copyright? I suspect it is the version FIDE World Chess Cup 2017 Interview with Vladimir Kramnik (Youtube channel: Georgia Chess; 'Published on Sep 8, 2017'). In this ongoing series about Top eBay Chess Items by Price, the ultimate place to go for high-end artwork featuring chess is Sotheby's. A few months ago we had A Chess Painting and a Namesake (December 2017), where the links lead back to previous posts featuring Sotheby's auctions. 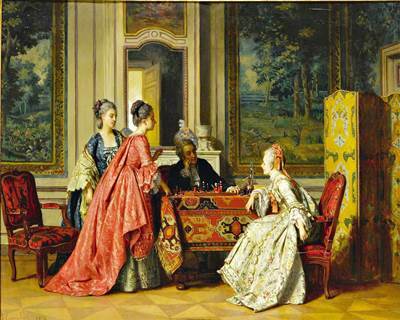 The item pictured below was titled 'Jean Carolus - The Chess Players'. It sold for US $9,500 after four bids at 'live auction bidding'. The auctioneer's page, carolus, jean the chess players (sothebys.com), informs 'Estimate 12,000 - 18,000 USD; LOT SOLD. 11,875 USD (Hammer Price with Buyer's Premium)'. The eBay description repeated the name of the artist, the title of the painting, and the estimate; then added '30 1/2 by 38 in. ; Oil on canvas' followed by a long condition report and a provenance. I was curious to see if the work had been noticed in any of the usual online collections, so I followed the Google image search steps detailed in 'Mystery Painting' Still a Mystery (January 2017). It appears that useful functions like 'Find other sizes of this image' and 'Visually similar images' have disappeared recently. The page Getty load of this: Google to kill off 'View image' button in search (theregister.co.uk; 12 February 2018) blames Getty Images for the change. Jean Carolus (Brussels, 1814–1897, Paris), a Belgian painter of genre scenes and interiors, spent much of his life living and working in France. Noted for his depictions of figures set within interior scenes, he is esteemed for the high degree of finish and jewel-like quality attained in these works. That last sentence certainly applies to the this post's featured work. 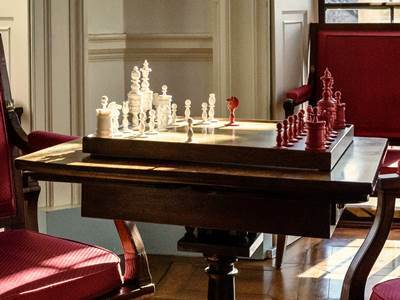 Play Chess - Thomas Jefferson's Monticello © Flickr user Geoff Livingston under Creative Commons. Chess was one of Jefferson's favorite games. The following are references to chess in Jefferson's and his family's papers compiled by Monticello researchers. Here is a selection of the most interesting of those references. 1801 December 4. (Jefferson to Thomas Mann Randolph). "I will pray you at the same time to send me Philidor on chess, which you will find in the book room, 2d. press on the left from the door of the entrance: to be wrapped in strong paper also." 1818 December 4. "When Dr. Franklin went to France on his revolutionary mission, his eminence as a philosopher, his venerable appearance, and the cause on which he was sent, rendered him extremely popular. For all ranks and conditions of men there, entered warmly into the American interest. He was therefore feasted and invited to all the court parties. At these he sometimes met the old Duchess of Bourbon, who being a chess player of about his force, they very generally played together. Happening once to put her king into prise, the Doctor took it. 'Ah,' says she, 'we do not take kings so.' 'We do in America,' says the Doctor. "At one of these parties, the emperor Joseph II, then at Paris, incog. under the title of Count Falkenstein, was overlooking the game, in silence, while the company was engaged in animated conversations on the American question. 'How happens it M. le Compte,' said the Duchess, 'that while we all feel so much interest in the cause of the Americans, you say nothing for them?' 'I am a king by trade,' said he." c.1853. (Ellen Wayles Randolph Coolidge). "So he was, in his youth, a very good chess-player. There were not among his associates, many who could get the better of him. I have heard him speak of 'four hour games' with Mr. Madison. Yet I have heard him say that when, on his arrival in Paris, he was introduced into a Chess Club, he was beaten at once, and that so rapidly and signally that he gave up all competition. He felt that there was no disputing such a palm with men who passed several hours of every evening in playing chess." c. 1853. (Ellen Wayles Randolph Coolidge). "My grandfather taught me to play chess, liked to play with me, and after our dinner, in summer time, he would have the chess board under the trees before the door, and we would have our game together. He had made, by his own carpenter and cabinet maker, John Hemmings, and painted by his own painter, Burwell, a small light table, divided in squares like a chess board and with a sort of tray or long box at two of the sides to hold the men and put them into as they were taken off the Board. It was a very nice, convenient little thing and purfectly answered the purpose for which it was intended. This was called one of Mr. Jefferson's contrivances." For more about the chess set, see Chess Set (English) on the same site. Charging for TWIC is a non-starter, so I have to find some other way of financing my own time to do it. It's more than justified in terms of its utility. Q: Here's a question from Greg Shahade, a name that may sound familiar. He says, 'Why doesn't Mark have a Patreon page? He would make huge money.'  A: I'm sorry?  Q: Do you know what Patreon is?  A: No clue at all. That's probably the answer to his question.  Q: I'll tell you, because Perpetual Chess has a Patreon page. Basically it's a way for people to support independent art. Patreon is a membership platform that provides business tools for creators to run a subscription content service, as well as ways for artists to build relationships and provide exclusive experiences to their subscribers, or "patrons." It is popular among YouTube videographers, webcomic artists, writers, podcasters, musicians, and other categories of creators who post regularly online. It allows artists to receive funding directly from their fans, or patrons, on a recurring basis or per work of art. Coffee Chess is creating Entertaining Games That Will Inspire The World to Play Chess! I'm sure there are many more like these. I frequently use TWIC for research on chess history and would certainly contribute to a TWIC Patreon page. As usual with anything involving money, some caution is required. How much of a donation eventually reaches the content creator? That's a question that I'll leave for another day. For the rest of the commentary, see Nakamura-Carlsen... (twitch.tv/chess). Chess.com and Twitch today announced a multi-year partnership to benefit chess streaming and major chess events. Twitch had long been the broadcast partner for Chess.com's regular chess programs and major events like the Speed Chess Championship and PRO Chess League. Now the social video service will officially partner with Chess.com as a sponsor for its entire lineup of chess events and to help grow the global brand of chess as an online spectator sport. "I've been a video gamer my whole life," said Erik, CEO and founder of Chess.com. "To see the game of chess reach this status among other top online games is a dream come true and something I never imagined when starting Chess.com. I'm more excited than ever about the future of online chess. I cannot imagine a better partner than Twitch." Twitch is a live streaming video platform owned by Twitch Interactive, a subsidiary of Amazon.com. Introduced in June 2011 as a spin-off of the general-interest streaming platform, Justin.tv, the site primarily focuses on video game live streaming, including broadcasts of eSports competitions, in addition to creative content, "real life" streams, and more recently, music broadcasts. Content on the site can either be viewed live or via video on demand. What are some of the best chess channels on Twitch? First, the obvious one: Twitch.tv/chess. But outside of the biggest events, who else is streaming Chess.com and where can you find them? There are already dozens of streamers and channels listed right here at Chess.com/streamers. Chess.com has partnered with Twitch to bring chess fans around the world more options to watch their favorite players. To grow the chess streaming ecosystem, Chess.com and Twitch are offering a number of benefits to chess players of all skill levels who want to get involved. How do I start streaming on Chess.com?  First, singup [sic] for a username and channel url at twitch.tv (your channel will be twitch.tv/yournamehere with whatever name you choose). That's pretty much everything I needed to know. Now I'll go watch some chess 'streams' and maybe even look at some other video games. After the previous post, Interview Videos : Grischuk, in this series on the players who will be competing in next month's 2018 Candidates Tournament (Berlin), next up alphabetically is GM Sergey Karjakin. Interview with the winner of the Candidates Tournament 2016. In the last round of the Candidates Tournament, Sergey Karjakin won the game over Fabiano Caruana and ended up first. My page on that Moscow event is 2016 Candidates Tournament. My final post on the tournament was Moscow Candidates - Wrapup (April 2016). Karjakin went on to lose the 2016 Carlsen - Karjakin title match in November 2016, thereby qualifying for the 2018 Candidates tournament. He has to be considered one of the favorites to qualify for the 2018 title match against Carlsen. Many of the recent posts in my series on The Sociology of Chess (November 2016) have featured videos. For a change of pace, let's have a podcast. Mark Crowther is the founder, editor, and writer behind the indispensable online periodical The Week In Chess (TWIC). In our conversation, we talked about Mark’s origins, TWIC’s humble beginnings, and how he manages the workflow of writing about and publishing a relentless torrent of chess games played by top players. Mark and I [Ben Johnson] also talked about the chess world more broadly. He shared a rumor he recently heard about the next FIDE election and discussed his own chess playing, plus shared book recommendations. Mark Crowther @MarkTWIC 10 Nov  @AndreyDeviatkin @mikhail_golubev  If Fischer Random is the answer then it's time to take up a completely different game. I'll cut Crowther some slack, because the success of TWIC is partly based on his weekly distribution of recent games. The interest in his work stems from players maintaining chess databases for opening research and would shrink (disappear?) if the game scores were chess960 games. Q: You're not a fan of chess960. As we're recording, we've got the Nakamura - Carlsen chess960 match as the next big event in the chess world. What is it about chess960 that you don't like? A: I think that the opening positions are ugly. Chess is a classical game. The pieces are on the starting squares that they're on for a reason. There's a balance, a symmetry to it that's just not there if you randomly rearrange the pieces. I was thinking about it this week. Why did I have such a viscerally anti-anti-chess960 reaction. It seemed a bit over the top when I reflected upon it. I think in part it was disappointment with Fischer himself. Fischer came back in 1992. There was an expectation that he might come back as a venerable gentlemen to play some other events. Then he came up with this chess960 which seemed to me to be a way of avoiding to come back at all. I think I'm right in thinking that. He didn't want to come back to lose, the main reason that he stopped in the first place and chess960 was his excuse. It has to be said that in the World Championship matches, particularly Gelfand vs. Anand, if the two players are highly booked up it's not interesting. That match was the pinnacle of preparation. Gelfand didn't like it when people said the match was boring. Theoretically it was fascinating for those who liked the positions they were playing, but there was very little chess in that match. It was all prep and that was not a good feeling. But Carlsen... I like the way that Carlsen plays. Most everyone does, but he's more anti-theory. That said, maybe this is the only way. Maybe chess960 in another five or ten years will be the only way to keep chess going. If theory really starts to get exhausted and people can draw well with Black, then where do you go? I had an email about that with David Navara. He was saying that he would very much like to play some professional chess960 events. At the moment, if he wants to, the only events available to him in the Czech republic have 30 pound prizes, very low prize funds. He would like to play proper chess960 and he thinks he's good. A number of top players are enthusiastic about playing chess960, so maybe I'm wrong. The Crowther interview includes 'EP.59' in the podcast title. For the previous 58 episodes and for future episodes, see the YouTube channel Perpetual Chess Podcast. This edition of Video Friday ties together two recent posts: The Lineage of AlphaZero (January 2018) and AlphaGo Netflix (ditto). On February 2nd, Hart House Chess Club hosted a very interesting event on Chess, Computers and AI, featuring the screening of the award-winning documentary "AlphaGo", followed by an elite lecture by our guest speaker, Rhys Rustad-Elliott (sophomore at [University of Toronto] in Computer Science). Rhys, originally from Vancouver, had an interest in Computer Science and Software Engineering since elementary school, when he started toying around with simple programs in Python. Nowadays, he’s interested in a wide variety of Computer Science related topics and recently finished work on his chess engine, Shallow Blue (a play on words of Deep Blue). For more about the lecture, see Rhys Rustad-Elliot introduces “Shallow Blue” and reflects on “Alpha Go”, Computers and AI (harthousechess.com). 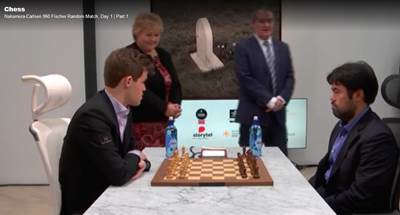 During the recent Carlsen - Nakamura match, Fischer Random 2018 (frchess.com), the setting received considerable attention. Standing behind Magnus Carlsen is Erna Solberg, the Prime Minister of Norway, who made the ceremonial first move for GM Carlsen. For the rest of the commentary, see Nakamura-Carlsen 960 Fischer Random Match, Day 1 | Part 1 (twitch.tv/chess). Today being Mardi Gras, and me having no concrete ideas and little time for a more profound post, let's just celebrate the day. Seen on eBay: 'Chess sports carnival parade car in France original 1950s photo postcard'. Size: approx. 3.5" x 5.5" ( 9 x 14 cm). That's Nice, France, where Le Nain Jaune means 'The Yellow Dwarf'. As for 'Const', I'm not sure what it means -- maybe 'constructeur' of the float? 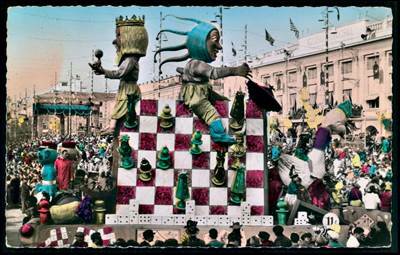 For another take on the same topic, see Chess Carnaval (March 2012). I calculated that, at the rate of one player per week, I have just enough time to review the eight players who will be starting the 2018 Berlin Candidates Tournament in March. ...and last seen in Interview Videos : Ding Liren; continuing alphabetically, next up is GM Grischuk. The popular Russian grandmaster qualified via the FIDE Grand Prix (not to be confused with the non-FIDE Grand Tour). An interview with Alexander Grischuk, who is only a point behind Magnus Carlsen going into the blitz segment at the Paris Grand Chess Tour. For more about the tournament, see Paris GCT | Grand Chess Tour (grandchesstour.org). As far as I can tell, this is the first daguerreotype seen on Top eBay Chess Items by Price. One eBay post last year, Morphy CDV (September 2016), as well as its follow-up Brady CDVs (ditto), touched the subject, but took it no further. 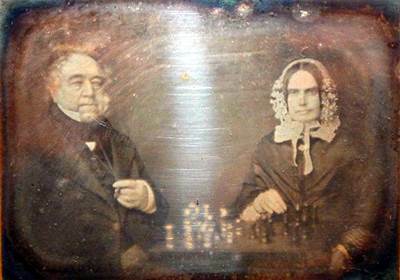 The item pictured below (which I've brightened considerably) was titled 'Rare Victorian Framed Daguerreotype - Named Man & Woman Playing Chess - 1840s'. It sold for GBP 495.00 ('approximately US $683.45' according to eBay) 'Buy It Now'. This is a very rare genuine framed daguerreotype of an elderly couple playing chess at a table, dating from the 1840's. The daguerreotype is in its original gilt edged frame and appears to have been a gift from a Miss Anson to a friend of her Uncle Henry and Mrs P[...?] Ward with the additional comment "She is very serious". The frame has obviously not been opened up at the back for many years but must have been re-papered at a later date and it is in good condition. There is some oxidisation around the edge of the image and a few specks that are under the glass as well as a few light scratches in the top right hand corner which aren't visible unless caught in the correct light. The image measures 9 cm x 6 cm in a 15 cm x 12.5 cm frame. A wonderful antique daguerreotype that would grace any collection. The comment written on the back of the item is given in the description as 'She is very serious'. The last word looks to me to be something else, starting 'sel...', but I can't guess what word. She certainly looks very serious. This photo looked vaguely familiar, but where? After searching this blog for 'statue' and 'sculpture', I found the post Distant Cousins? (September 2011); same statue, completely different angle. Chess Players © Flickr user F Delventhal under Creative Commons. In his sculptures, Colombian artist Edgardo Carmona showcases "likable characters that make Cartagena, Colombia, what it is." The sculptures, all carved from rustic iron, depict characters and scenes from Mr. Carmona’s hometown, where he was born in 1950. 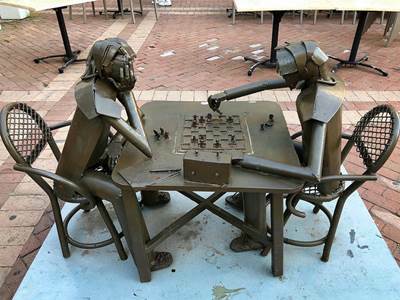 The sculpture even includes a rustic iron chess clock. These are serious players. In last week's Video Friday post, GK's Four Most Memorable Games, one of the four games was 'Deep Blue (Computer) vs Garry Kasparov; IBM Man-Machine (1997), New York, NY USA, rd 6'. By coincidence, I've been reading Kasparov's recent book, Deep Thinking, where he spends several chapters discussing that fateful match. Besides the 1997 match, the former World Champion also discusses earlier encounters with the Deep Thought / Deep Blue team. When it comes to his own activities, Kasparov is never an impartial witness and is sometimes misleading. In search of objectivity, we can compare Feng-hsiung Hsu's account of the same meetings in his own book, 'Behind Deep Blue'. I featured the book last year in Deep Blue 'On the Cover' (June 2017). In preparation for a future post or two, I created a cross reference covering the two books. The references for Kasparov's book use the Kindle's location ('loc') attribute. (A) The reference here is to when discussions began. See also loc.2595 (Ch.9 'The Board Is in Flames! '); loc.3124 (Ch.10 'The Holy Grail'); and loc.3381 (game 6). (B) Hsu doesn't mention this event. Kasparov says that the event had 6 GMs and an IM, and that Deep Thought finished with 2.5 points out of seven games. A previous post on this blog, Deep Thought/Blue in the Early 1990s (July 2015), says, '1991-03-19: DT2 in Hannover (w/ link), "Deep Thought 2 vs. 7 German GMs" at Cebit in Hannover'; also GK simul. (C) Organized by IBM Denmark. (D) See World Computer Chess Championship : 8th WCCC - 1995 Hong Kong. Kasparov's book also gives details about his games/matches against other chess computers. I should compare this to my page Garry Kasparov's Tournament, Match, and Exhibition Record (1973-; 'Last updated 2014-08-11'). Chess aficionados sometimes overlook or forget that their favorite game is just one member of a great family. The next video in this series on The Sociology of Chess (November 2016) serves as a useful reminder. A World of Chess by Jean-Louis Cazaux and Rick Knowlton, McFarland Publishing.  A vast and comprehensive view of the many forms chess has taken over the past fifteen centuries. Deeply researched, with over 400 illustrations and clear, concise delivery of game rules and information on the broad issues of chess history. For more on the same Youtube channel, see AncientChess. Here's Garry Kasparov doing what he does best -- playing chess. The way he explains the dynamics of a position is both entertaining and instructive. Grandmaster Garry Kasparov, considered by many to be the greatest chess player of all time, replays some of his most unforgettable games. He relives both the happiest and the most painful moments of his career. 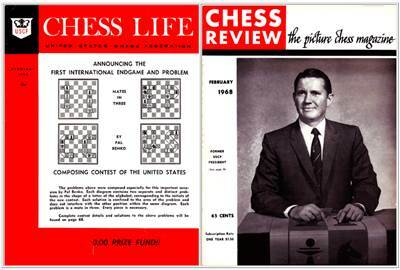 In contrast to two stories of the moment seen in last month's January 1968 'On the Cover', this month 50 years ago the two leading American chess periodicals featured a contest looking forward in time and a story looking back in time. The problems above were composed especially for this important occasion by Pal Benko. Each diagram contains two separate and distinct problems in the shape of a letter of the alphabet, corresponding to the initials of the new contest. Each solution is confined to the area of the problem and does not interfere with the other position within the same diagram. Each problem is a mate in three. Every piece is necessary. The prize fund, sponsored by the Piatigorsky Foundation, was $500. According to Inflation Calculator, that would be the equivalent of around $3500 today. Nine of the 32 pages inside the magazine were used to cover 'The Fischer Affair', in which Bobby Fischer quit the 1967 Sousse Interzonal while he was leading the tournament. We regret to announce the death of Jerry Spann, popular former President of the United States Chess Federation and representative of the U.S. in the FIDE meetings.